Thanksgiving was lovely. Nothing terribly momentous. And please pardon my Monday morning cynicism, but see below. This photo is the reason why Jews don't celebrate Christmas. That and the fact that we could never figure out how to affix a tree to the top of our cars without it falling off onto the highway. 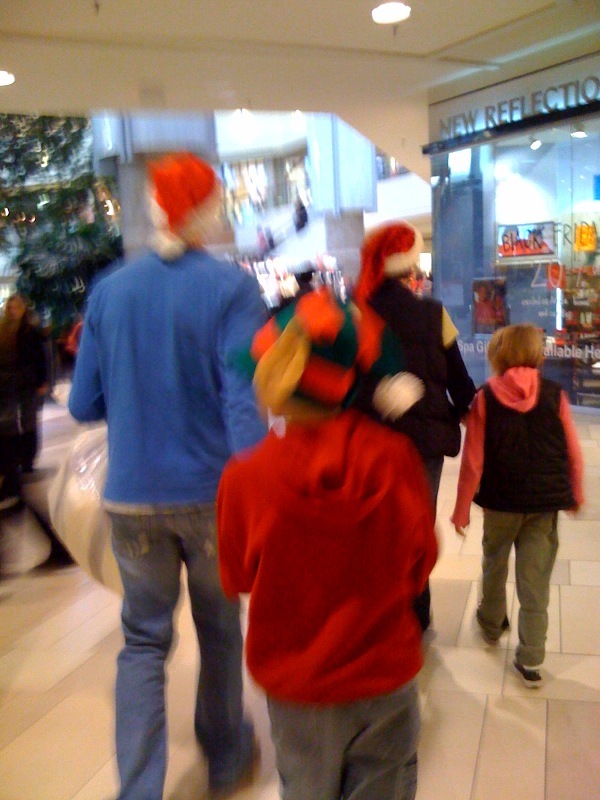 We just wouldn't wear Elf hats to the mall. We wouldn't. And I'm trying not to criticize, I'm just saying that it would be a cold day in you know where when Beth Weinblatt walked into Ridgedale sporting an Elf hat. And I really don't limit this just to my family. I just don't see it happening. Cynicism #2. On Thursday night, Thanksgiving evening, Nicollet Mall ('main drag' in downtown Minneapolis that is closed to vehicles, just buses and pedestrians) was open for driving. 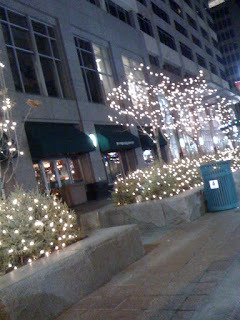 Cars were allowed to drive down the Mall just for the night to view the holiday lights downtown. I love lights, and so Jeremy and I drove there to see the displays! We expected to be wowed and amazed as we sat in the line of cars waiting to do what is normally illegal. How rebellious we were, waiting to drive down and see what we could see. Finally, we got to Nicollet, turned, and saw nothing. We figured the display started farther down the street, as we were at the end, Nicollet and Washington Ave.
We drove, slowly, and drove, even slower. My head was angled to look ahead, to see the big displays. And this is what I see. Even Jay Weinblatt could put up a better display than that. For real? We drove down the entire mall, and this was the most "Awesome" display we saw. 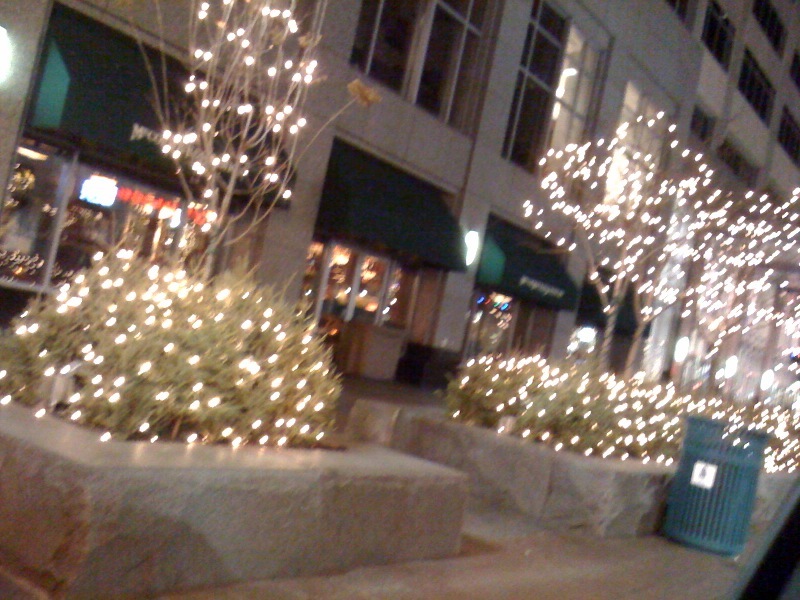 Thank you city of Minneapolis, that was quite a treat. After this little rendezvous I tried to get Jeremy to go to WalMart as they were open 24 hours. We protested, as we all know, he is a loyal Target employee and that would be treason. Not that I like Walmart, but I did want to get a glimpse of the crazies, waiting for their $20 TV's or whatever. C'est La Vie. We drove around Lake of the Isles, saw some genuinely cool lights. And went home, to sleep off the turkey. I shared this one witih my mom...she loved it! oh, and I love it too...and btw, as far as I know, there are no Frank family members that eat poo, their own or other's....thought you'd like to know it is a family trait therefore you need not worry about Jer. Love you both!